The small Ourense municipality of O Bolo, in the region of Valdeorras, contains in just 91 square kilometres two monuments of exceptional importance and beauty. One is the castle, built in the thirteenth century and reformed in the sixteenth after being badly damaged in the Irmandiñas Revolts, which dominates the small village of medieval design on which the Town Hall is still located today. The other remarkable location of the municipality is the Sanctuary of Nosa Señora das Ermidas, which surprises both for its location and for its baroque magnificence. In fact, it is the contrast between the steep slopes that surround it and the sober and at the same time sumptuous architecture that is the most outstanding aspect of the sanctuary. The sanctuary belongs to the diocese of Astorga, and it is in fact from the Bierzo lands that comes the original foundation. It is told that in a cave in the area an image of the Virgin was found, the same image that, much later, appeared to a convalescing bishop of Astorga so that he would miraculously regain his health. The bishop, Alonso Mejía de Tovar, would be the one who commissioned in the seventeenth century the construction of the church. The main building is a jewel of Galician Baroque. It consists of a nave to which they later added another two, of irregular size. The church seems to be resting on the very rock of the mountain. From one side of the main altar you can climb up to the transept, to admire more closely the figure of the Virgin of As Ermidas. 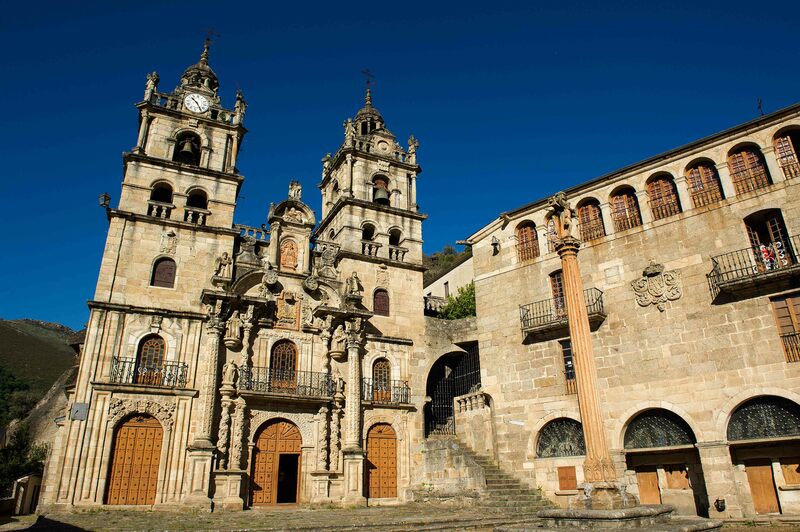 The façade is a Baroque prodigy designed at the beginning of the eighteenth century by the architect Juan Martínez Pita, responsible at the time of the reform of several Ourense churches and who probably achieved his most outstanding work here. There is no shortage here of the elements that make the baroque style exuberant and functional at the same time: the classic columns combined with the Solomonic, the play on volume in the towers, the ingenious integration of the sculptures into the pediment and the gaps left in the construction… For those who know the Cathedral of Santiago, the façade of As Ermidas may very well look like a condensed Obradoiro. A polychrome shield of the bishops of Astorga, promoters and administrators of the temple, presides over this main entrance. The artistic ensemble also has an undeniable Portuguese flavour. The neighbouring country is referred to, for example, by the stone cross located in the atrium, in front of the church and the building that served as residence for the bishop. It was made, in fact, by a Portuguese sculptor, Manoel Miranda, also in the eighteenth century. The exceptional Via Crucis that starts in the church and ascends along the main road of the village can also be associated to others located in Portugal. Among the houses, taking advantage of walls and fountains, in unsuspected corners, appear the stations of the Passion of Christ, which can be followed walking up the hill. In the middle of this Via Crucis is one of the most beautiful fountains that can be seen in Galicia, that of A Dormiñona (“la dormilona”). Exceptional example of popular architecture, the main body shows the image of a young woman resting on a jug, asleep on top of her right hand. The set is crowned by a Marian shield and another feminine figure. The Sanctuary of As Ermidas is the backdrop of one of the most popular pilgrimages in the area, which takes place during Holy Week. Hundreds of worshipers from the surrounding areas come to O Bolo to participate in it and enjoy a privileged environment in which even a fluvial beach can be found to cool off if the heat of spring becomes too much.